CAPTION: This single-story home, built by the carpentry program at Grand River Technical School and located at 2010 Lakeview Drive in Chillicothe, was sold at auction on Tuesday, May 27. The three bedroom home has 1,950 square feet of space. Among its features: an entryway with 10' ceilings and oak crown molding with planter shelf and tile floors, custom oak cabinets throughout, a large great room with gas log fireplace, an unfinished basement, a furnace dual fuel heat pump, and a large deck. The Grand River Technical School constructed a house in the 2007-08 carpentry class to be auctioned off at the end of construction. On May 27, Marjorie Murry of Wheeling made the winning bid on the one-story, 1,950 square foot home against other bidders on location. The auction brought in many attendants to bid on the 3-bedroom, 2-bathroom custom built home by the GRTS students, co-director at GRTS Ron Wolf said. 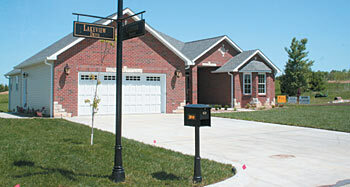 The home is located at 2010 Lakeview Drive in Lakeview Estates and sold for $210,000. Some of the features this house boasts are an entry way with 10' ceilings, custom oak cabinetry with oak trim throughout, new stainless steel kitchen appliances, and a front-load washer and dryer set.